March's Children's Book Club selection was Tales of a Sixth-Grade Muppet by Kirk Scroggs. Please note that this blog was written by the Book Club participants and transcribed by Miss Lisa. This funny book tells the story of Danvers Blickensderfer and how he becomes a Muppet. Danvers is a big fan of Gonzo and one day he goes to bed and wakes up as his hero! There are a lot of adventures in store for the kid who is considered the class weirdo. Danvers is always bugged by his gnat of a sister, Chloe. When Chloe sells Danvers' transformation story to the networks for money ($$$!!! ), he is upset. But when she ends up filling out an application for him to be a Muppet Intern and he gets in, he's pretty excited (although Chloe just did it in order to make more money off of Danvers). Once Danvers starts Muppet School, he meets Fozzie, Miss Piggy, Rizzo the Rat, and...his hero, Gonzo!!!! Yay! 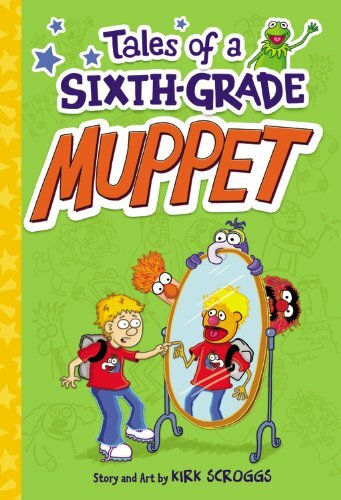 Be sure to read Tales of a Sixth-Grade Muppet in order to find out what adventures Danvers and his new friends have. Our third and fourth grade readers really enjoyed this funny book. We worked together on fill-in-the-blanks of "the character I wouldn't want to share a bunk bed with is____" and "create your own Muppet". The answers were pretty funny and interesting. (unfortunately, I have to adlib now because this part of the blog didn't save!) Harry thought that some of the characters were hilarious, though he wouldn't want to be any of them. Cameron created a Muppet who is party bunny/party razor paws. Andreas liked the story because it was filled with Muppets. And Ben felt that this was a well-told story and he didn't want us to give away too much in the review/blog. All in all, our reader response to this book was good. It averaged a 4.25 out of 5 stars. All Book Club sessions are held on the first Wednesday of the month from 3:00-4:00 p.m. The book for April's Children's Book Club, to be held on April 4th, is Holes by Louis Sachar. May's Club will be held on May 2nd and we'll discuss Artemis Fowl by Eion Colfer. The book for June's Children's Book Club, to be held on June 6th is Wonderstruck by Brian Selznick. Books will be ordered in advance by Miss Lisa and held behind the Circulation Desk. Please be sure to come in and pick up your copy before each meeting!